The Album Of The Day is "The Resisting Dreamer" by Tusk. 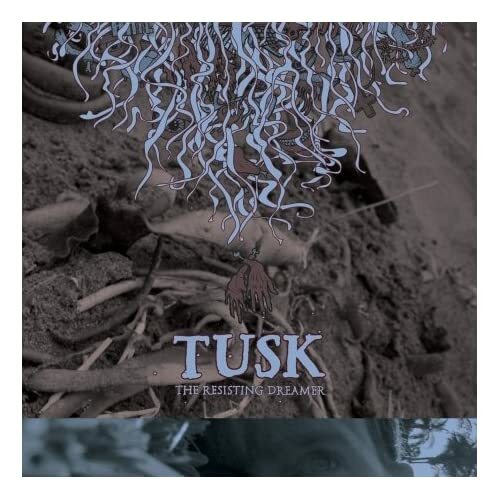 Tusk consists of three members of Chicago post-metal pointdexters Pelican, with Kayo Dot frontman Toby Driver and Young Widows’ Evan Patterson sharing vocals. Their first on Hydra Head, The Resisting Dreamer is their second full-length. The album feels like a much-needed jaunt into the experimental for the instrumental-minded Pelicanites, with vocals sparse and unobtrusive for the most part. It is a mere four songs (about 38 minutes), and functions as one long song rather than individual units. Despite this, the division is absolutely logical, with each “chapter” having its own mood, style and flavor. The album is largely avant-garde, with elements of drone, grind, doom and post-metal present throughout. The opening riff of first track “Everlasting Taste of Disguise” dances in on the high end of the spectrum, and sounds briefly Pelican-esque. Not to be pigeonholed, though, Tusk quickly shed their familiar stylings for echoey, angular and deep-rumbling horizons with only a hint of the band’s sometime alter ego. The song continues in this way, with vocals eventually joining the discordant instrumentation in a mournful drone. In time, this gives way to “Cold Twisted Aisle,” which sounds vaguely like noise-merchants The Number Twelve Looks Like You, both in angular instrumentation and shriek-yelled vocals that are presently causing nearby elders to furrow their eyebrows. Mission accomplished, one might say. Track three briefly revisits Pelican territory, but with a more aggressive post-metal approach. The occasional near-death metal yell accents this, making “Life’s Denial” one of the most headbanger-friendly tracks offered here. The track goes into its death throes around the three-minute mark, with fading bellows and droning guitar marking an equally long transition to final track “Lewdness and Frenzy of Surrender.” This continues for a further six minutes, and the extended downtime may warrant use of the fast-forward button. In truth, after the first few measures there’s not much to gain from the rest. The 16-minute epic of the album continues on much in this same way, changing gears four, maybe five times to gradually fade to its final note.